Most centipedes are outdoor creatures. They live in damp, dark areas under rocks, leaves, or mulch, and only enter our homes on occasion. Then there is the house centipede (Scutigera coleoptrata). Belonging to the class of Chilopoda, these arthropods are a common indoor pest in the United States. They are well-known for their many legs and high-speed getaways when you try to trap them. Although these centipedes are considered beneficial because they eat other pests, they are unpleasant, creepy in appearance, and bite if they feel threatened. 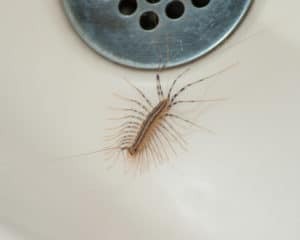 No one likes to encounter these pests, and everyone who does wants to know how to get rid of centipedes in their home. Legs, lots of legs! That’s the quickest way to identify these creepy crawlers. The name “centipede,” which means 100 legs, is actually a misnomer. They have anywhere between approximately 15 and 175 pairs of legs. Each pair is attached to a segment of the grayish or brownish body that ranges in size from 1” to 1-1/2” inches. The body has three dark stripes running down the back and the legs are banded with white. The house centipede hangs out in dark, damp places like basements, bathrooms, attics, and closets. In these places, they’ll lay their eggs and prey on spiders and other insects. You won’t find a nest of centipedes, because they are independent creatures. This makes it hard to target more than one at a time. The best practice for eliminating the occasional centipede from your home is to either kill it with a shoe or vacuum it up. If you prefer more peaceful methods, capture it and release it. But you’ll have to be very quick to catch one of these speedy pests! Finding lots of centipedes or having an infestation may require you to call in a professional. A pest expert can identify the species and inspect your home to find the source of entry. Often, they’ll combine natural and chemical approaches – caulking cracks, setting up sticky tape traps, and even using an insecticide if it’s a serious infestation. Many of the methods to get rid of centipedes involve prevention and can be applied for other creepy crawlers, like millipedes or ants. Stop outdoor centipedes – and other pests they may prey on – from entering your home by caulking up cracks and crevices around foundations, doors, and windows, or near piping and wiring. Outside, remove anything stacked directly against the home or its foundation, like firewood, leaf piles, or mulch. The same goes indoors – reducing clutter and piles of paper or magazines stacked up against walls robs the pests of places to hide. Solve moisture problems by fixing leaky pipes or using dehumidifiers in damp basements. Remove their food sources – call a professional pest service to eliminate the bugs that centipedes have come to feed on. Because centipedes feed on other insects, finding them in your house could mean you have bigger bug issues. Call Green Pest Solutions at 877-636-9469 and let our trained specialists find the appropriate treatments for your situation.